For the woman who desires more creativity in her manicures, the sky's the limit where colors are concerned. Red and pink have their place, but so do black, silver and blue when it comes to jazzing up those nails. These blue manicures should give you plenty of ideas on how to use this color, whether it's soft and subtle, as seen here, or deep and attention-getting! This look takes nail art to an entirely new level. 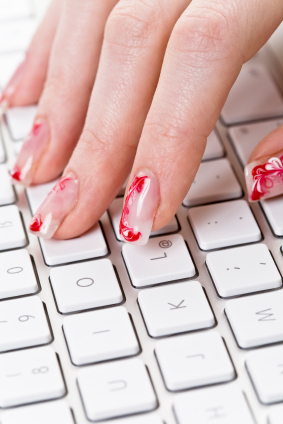 Skillful attention to detail and creativity help to create a one-of-a-kind manicure that's sure to be noticed. Of course, if classic looks are more your speed, you can wear a thoroughly modern shade like this -- with subtle hints of metallic -- and sport a sophisticated look that's not over-the-top. The traditional white-tipped French manicure has been turned on its head. Women are wearing tips in every color of the rainbow, including blue. These glittery blue-tipped nails sport additional accents in tiny adhesive gems, an unforgettable manicure for special occasions. Wear a garden on your fingertips anytime of year! These finely-detailed flowers sit on a soft blue background that match the sky. Instead of letting blue tips blend seamlessly into clear beds, this manicure relies on a thin white line to separate the two sections. Blue shares the spotlight with a pretty fuchsia, glitter and 3-D accents! They might be a bit much for the office, but they fit right into the party and night-clubbing scene. Another modern technique is to create the same look on all nails except one. Just one standout gets the full-glamour treatment with golden swirls. Now that you have ideas for cool blue manicures, see what pink nail designs today's woman may want on her fingertips!